ALIGARH, February 21- Sir Ross Masood Hall, Aligarh Muslim University celebrated 125th Birth Anniversary of Sir Ross Masood, the fourth Vice Chancellor of AMU and illustrious grandson of Sir Syed Ahmad Khan. On this occasion an Alumni Meet was also organized. Mr. Jamil A. Khan, Chairman & Managing Director, Samiah International Builders Pvt. 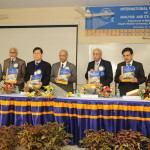 Ltd. was Chief Guest on this occasion. 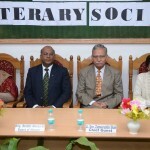 AMU Vice Chancellor, Lt Gen (Retd.) 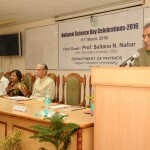 Zameer Uddin Shah presided over the function. Prof. Badruddin Khan, retired from Kashmir University and a former resident member of the Hall who lived during 1970-82, graced the programme as the guest of honour. The Chief Guest, Mr. Jamil A. Khan said that he always ready to provide help and assistance to the University, Sir Ross Masood Hall and its residents. 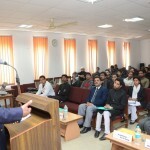 He urged students to be practical, advance and time favouring. In his presidential address, Vice Chancellor, Gen. Shah appreciated Sir Ross Masood Hall’s initiative to organize the programme to commemorate life and work of Sir Ross Masood. Provost of the Hall, Dr. S. M. Jawaid Akhtar welcomed the guests. Dr. Mohd. Ali Jauhar, Resident Warden, highlighted the life and contribution of Sir Ross Masood. Mr. Mohammed Faizan, Senior Hall Monitor described the achievements of the hall. Guest of Honour, Prof. Badruddin Khan remembered his days as a resident member of this hall. He appreciated the enthusiasm, excitement and discipline in students. Mr. Mohammad Khan, Senior Food Monitor proposed a vote of thanks. About 42 alumni from outside Aligarh attended the function. They also had an interaction with the resident members.